The truth is there are a lot more uses for a koozie than just holding a can of beer at a barbeque or tailgate party. Let people know about all of the other things they can do with that beautiful “beer can cooler” – imprinted prominently with your name and logo, of course - and many will be thrilled to have it and use it regularly. 1. 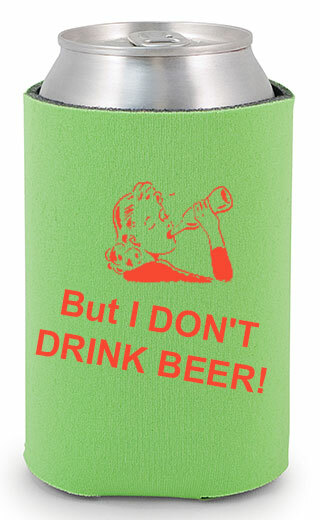 Keep soda or water cold – koozies aren’t just for beer, even though most people closely associate the two. Selling beverages at an event? Display a few soda cans and water bottles protected by an attractive koozie, and customers will get the idea quickly. 2. Keep your hands warm – it can get cold at football or soccer games in late fall and winter. Even if a cold beverage isn’t appropriate for the weather, koozies can still come in handy for those who didn’t bring gloves. Suggest that fans use one on each hand, to take the chill off. 3. Use a Deluxe koozie as a centerpiece or small vase – they’re the perfect size to hold a few flowers or a small arrangement. Companies holding luncheons or other semi-formal gatherings have put flowers into imprinted koozies in the middle of each table, and found that the koozies are never left behind. 4. Collect your change - many people use big jars to hold their spare change, but it takes forever to fill one of those. You can fill a koozie much more quickly, and feel like you’ve actually accomplished something. 5. Hold pencils, pens or markers on your desk – once upon a time, pencil holders found on every desk in an office. Today, people usually just toss their pens into drawers or leave them lying around, and eventually lose them. A Foam koozie is the perfect size to be a modern-day holder for writing implements. 6. Teach your children to keep track of their things – a selection of koozies can hold their crayons, their markers and chalk, and any other “art stuff” they use regularly. The kids will love the bright colors, too. 7. Give them as memorable wedding favors – koozies can be imprinted with the names of the bride and groom, the date of the wedding, or anything else which will make them stand out as a remembrance of the big day. They’re particularly appropriate for casual or outdoor weddings. 8. Send them along with direct mail pieces – the problem most people find when sending direct mail is that the envelopes never even get opened. It will cost you a little more in postage to send a koozie along with your mailing, but it’s almost guaranteed that an oddly-shaped package will be opened, and read, by your potential client. 9. Use them as floor protectors – the legs of many pieces of furniture, ladders, or other large items will fit right into a koozie, and will prevent your floor from being scratched. 10. Put a small ball inside of a koozie – if you’re having fun in the pool by throwing a ball around, a soft “cushion” around it will minimize the danger of injury. Sure, a few of those suggestions might sound a bit unusual. But try posting this list where you’ve got koozies for sale, or include it with a koozie you’re giving to a client. There’s no telling what could grab their imagination and get them to regularly use a koozie that shows off your company or team’s name. And after all, isn’t that the point? With an experienced staff that has been in the printing industry for decades you can trust us with your custom printing needs. Customize each item by adding unlimited text and clip art. We offer the most competitive prices on all of our personalized items. Our staff is one of the most knowledgeable in the industry. We take pride in offering the best customer service possible to prove ourselves to you!